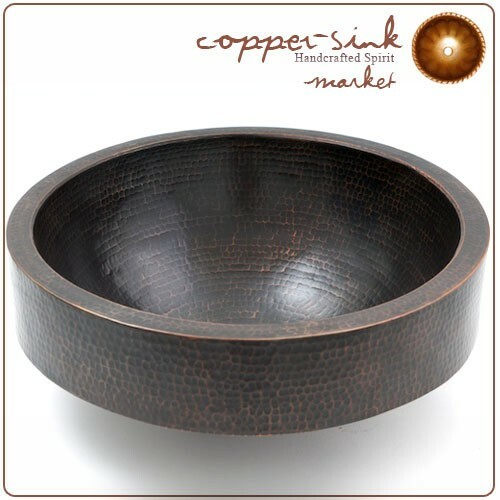 17x7" Copper Handmade Bar Vessel 3" High Apron Round Sink with 1" Flat Lip, 2" Drain and Dark Finish, 18 Gauge, 99% Pure Copper and 1% Zinc (Lead Free), Furnished without Drain. This beautiful craftsmanship work on recycled copper has been typical and traditional from Santa Clara del Cobre, Mich., Mexico for decades now and features both the Mexican style and some great functionality and hygiene guarantee. This copper design, quality and style is extraordinary, Our copper sink are guaranteed to be of the highest quality, Great for home & commercial use! Please note: As the size and the feature of both drain and sink vary, drain is not included. Customer need to select the rigth drain according to their sink size. We ship our products from Laredo TX. However, you may reseive it directly from the factory in Mexico due to stock fluctuations and also if custom finishes or custom construction is needed. Returns: 30 days return for defective product, no restocking fee.